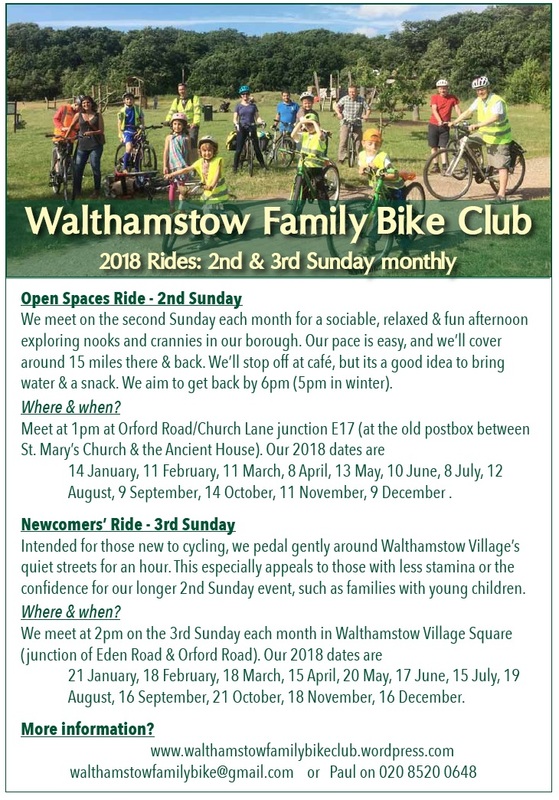 Celebrate the arrival of the winter months with a short sociable family-friendly bike ride round Walthamstow to view local festive decorations & illuminations. We’ll set off from Walthamstow Village Square (junction of Eden Road & Orford Rd) at 3.45pm, cover 4-5 miles and end up back at the Square just around 5pm, with the option afterwards to retire to a local pub. Meet from about 10:30 for an 11 o’clock start outside Walthamstow Library / Farmers’ Market. Join Nic for the peaceful ride over mixed surfaces (be ready for a bit of mud!). The destination and direction of the ride will be discussed at the start and will account for wind speed and direction and may be train-assisted – so take your Oyster or contactless debit card with you. A short pre-holiday ride to the Olympic Park, and a café stop. Bring lots of lights and reflective stuff and bells if you have any – we’ll ride and celebrate! Meet at outside Walthamstow Library, for a departure by 2pm. We should be back by 3-4pm. Come to Belvedere Road in the Southbank by 7:30pm to join this energising bike party if you’re already in Central London, or else meet Nic outside Walthamstow Library by 6pm to ride there together. Join Bridget for a gentle family ride around Lea Valley & Wetlands. We’ll be back by midday. The route is mostly off-road, with two short stretches along quiet roads. The route will include some sections of tow path. Leisurely pace. We will cycle via: the Lea Valley towpath round to the Walthamstow Wetlands trail and back. Parking is free in the Town Hall car park on Saturday. Please arrive early, giving time for a quick bike check before setting off on time. Please bring a spare inner tube.